Busan is the second largest city in South Korea, next to SoKor’s capital Seoul. Busan is probably one of the best examples of harmony between mountains, rivers and sea which enjoys a temperate climate that never gets too hot or cold. 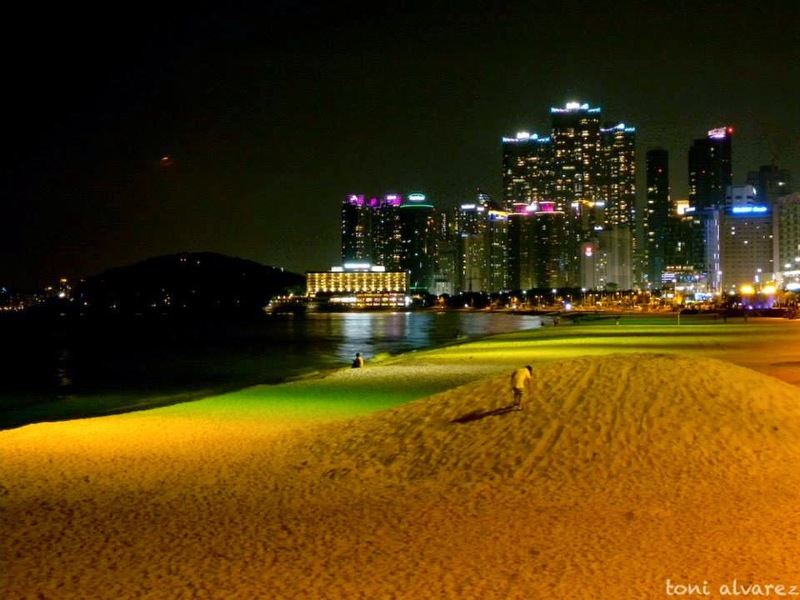 Busan has been a favorite destination for Koreans and tourists alike especially during summer because of the long stretch of fine, white, beach in Haeundae. 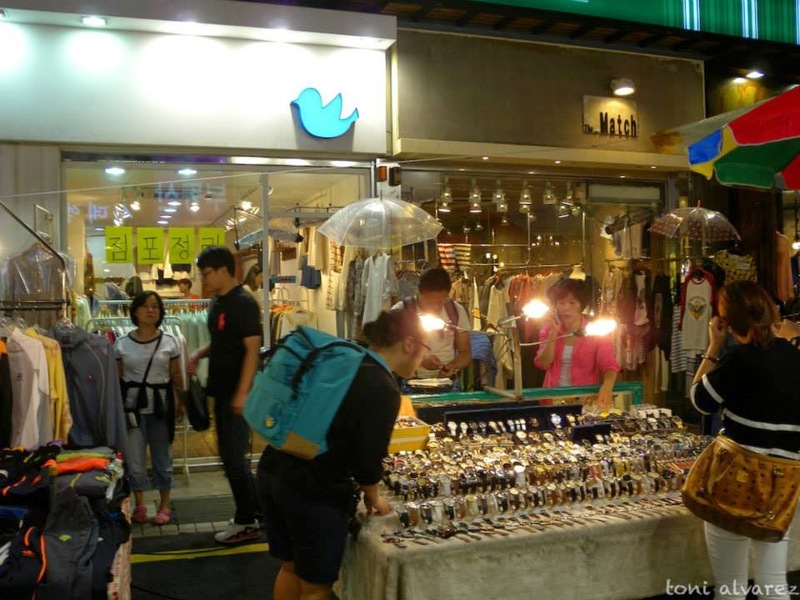 If you want to experience culture, shopping, nature and adventure, then Busan is for you. Korea’s currency is South Korean Won which is roughly equivalent to Php 0.04 depending on the forex. 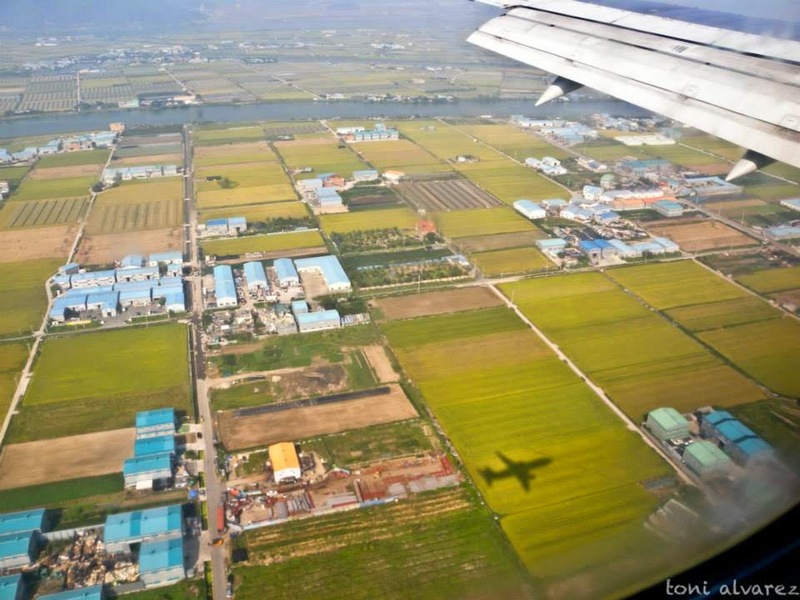 If you are planning to go to Busan anytime soon, then this travel guide might help. P.S. We actually stayed in South Korea for 6 days but since we went to Jeju in between, I will write a separate travel guide for Jeju Island. 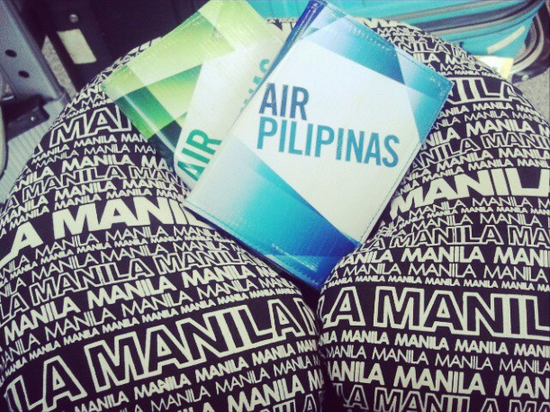 By Air: Philippine Airlines, Cebu Pacific and Air Asia fly to Busan, South Korea. Travel time is approximately 3 hours and 30 minutes. There’s a time difference between Korea and Philippines, Manila being one hour behind. This is an international travel so it is only necessary for you to have a valid passport. You can secure one from the Department of Foreign Affairs. If you already have a passport, make sure it is still valid for 6 months from the time of travel. Meaning, if your passport will expire on April 21, 2015, then it is still safe to travel and return back before October 21, 2014. Any date beyond October 21, you'll no longer be allowed to leave the country. If in doubt, you can always call Korean embassy in Manila, or Pilipinas Teleserve (24-hour Passport Assistance) 737-1000. 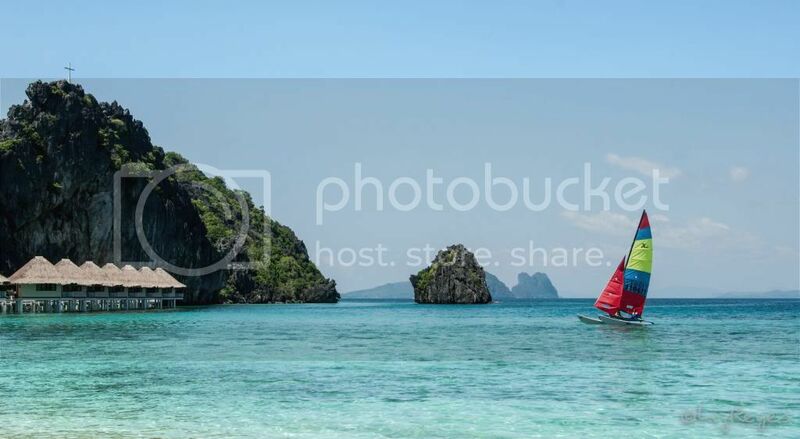 - Philippine passport holders are required to secure a visa. Visa processing is free and would only take 5 working days. However be sure to apply for visa 1 or 2 months prior to your departure in case the consul asks for additional documents. Korean visa is now good for multiple entry. - Koreans are not really good at conversing in english so you might find it hard to ask for directions. Even their public signages are all in Korean so better maximize Google for directions if you want to visit a specific tourist spot. Accommodation: There are lots of grand hotels and cute guest houses in Busan that you won’t be having a hard time in finding one. The only problem you’ll encounter is which, for you, is the cutest and your planned activity. 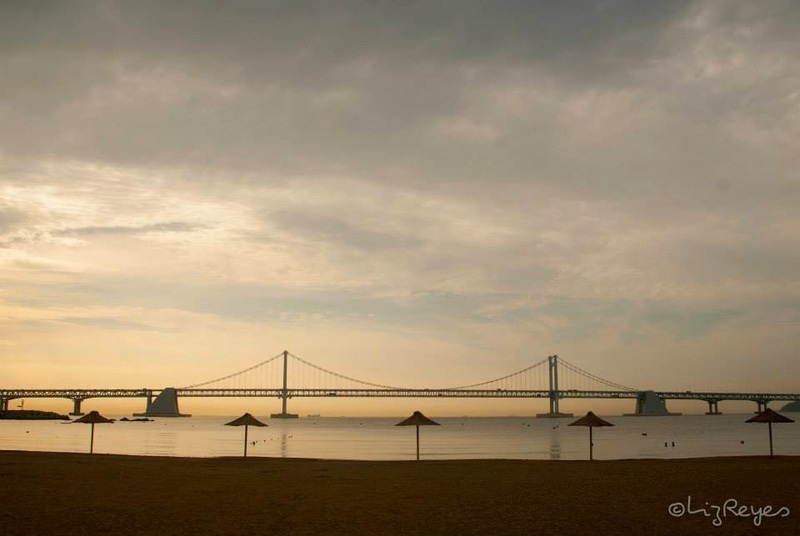 If you want to be near Busan’s famous Haeundae Beach, then better book an accommodation near Haeundae train station. 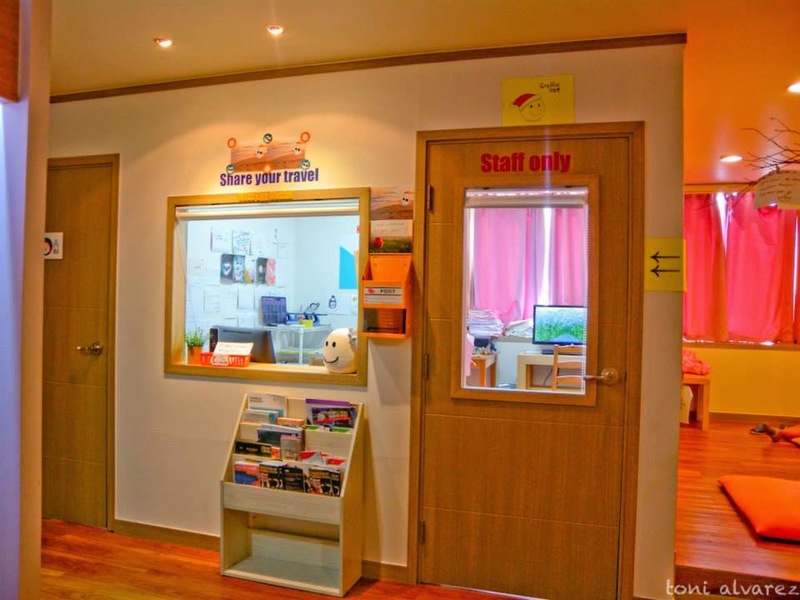 If you want near the shopping area, book near Nampodong station. Meal: Food in Busan is not really affordable. In fact, you’re already lucky if you’ll be able to buy a full meal for KRW5,000-6,000 or Php250 more or less. 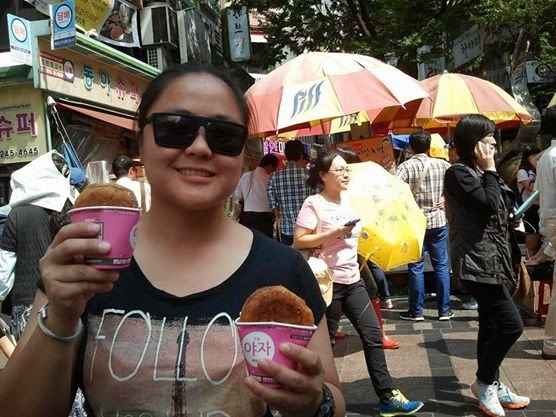 If you’re on a tight budget, you can always go for Korean noodles, but you can’t always go on a noodle diet because trying out authentic Korean food is part of the adventure. Experiencing Korean Barbecue and drinking Soju (rice wine) is a must. 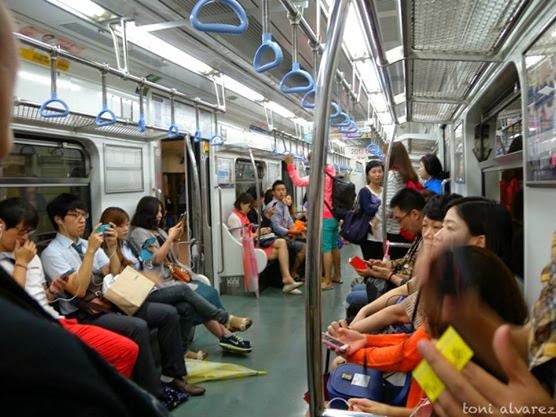 Transportation: The main transportation system in Busan is their subway. This is a very efficient way to reach your destination on time. 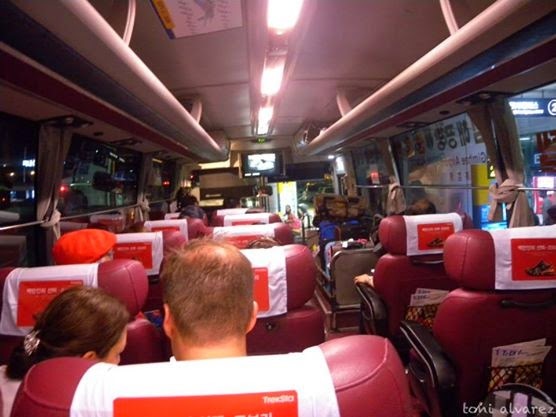 Taking the bus is also comfortable although travel time is a little bit long because there are many bus stops. Since the signages outside and even inside the bus are all written in Korean, make sure you know the bus number that will pass by your destination and the nearest landmark where you wished to be dropped of. Asking the bus driver won’t actually help because most probably, he won’t understand you. In short, rely on your map, GPS and own instinct. 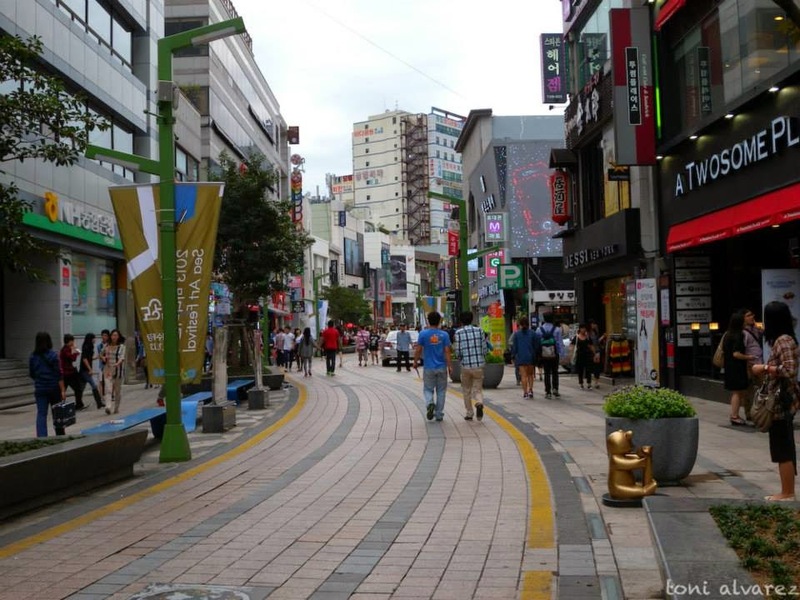 Touring: No need to hire a tour guide to visit the famous sites in Busan. If you already did your research beforehand and know the nearest subway stations, bus numbers and nearest landmarks, then you won’t get lost. It might also help if you print a copy of your itinerary and the photo of the tourists spots you want to visit. This is just in case you really need to ask for their directions and all that’s left is for you to show the photo of the place you wish to visit. Camera- You will regret if you don’t bring one. 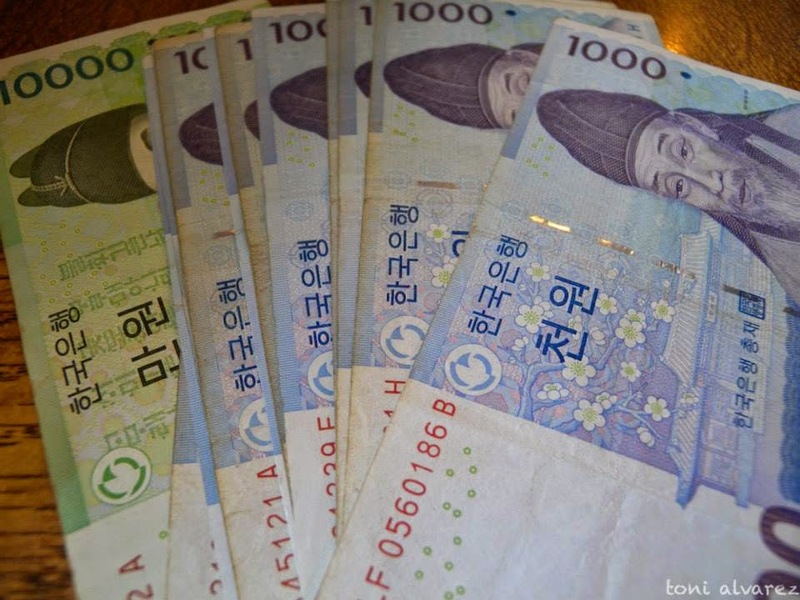 BUDGET: Bring dollars with you and exchange them to Korean Won when you are already in Busan. However, you will need won when you ride the limousine bus at the airport so be sure to exchange even $100 at the airport in Manila. We exchanged our money at Paradise Hotel’s casino near Haeundae because their exchange rate is reasonable enough. Island). Please also note there’s three of us who traveled so cost of accommodation and touring may vary if you will travel in big group. 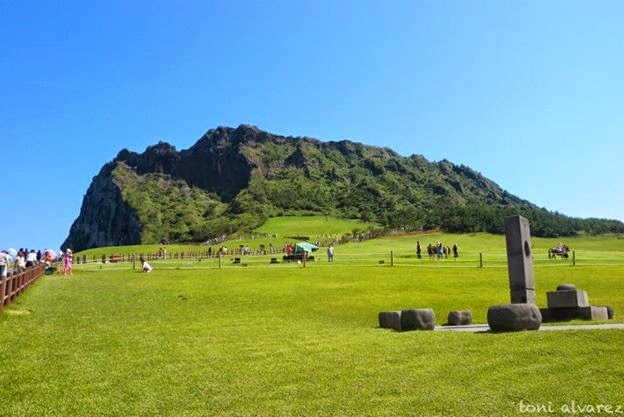 You need to have: A budget of approximately Php50,000-Php70,000 (good for two and exclusive of plane ticket) is more than enough money for your Busan and Jeju trip (will write a separate itinerary for Jeju Island). 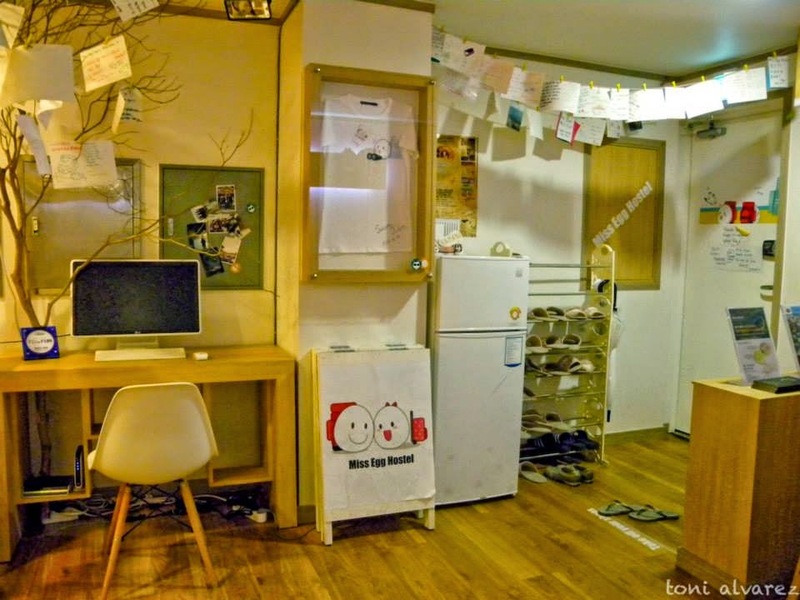 You can save more if you opt to stay in a sort of dorm room, shared bathroom or a contemporary guesthouse in Jeju. 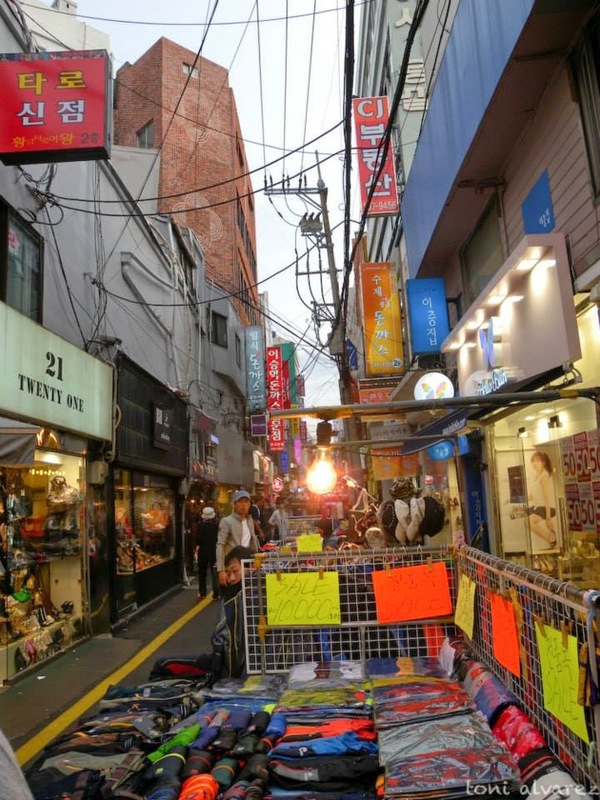 Day 1 is just for settling down and planning your itinerary on your succeeding days in Busan. Explore the city by foot and familiarize yourself with the streets and the best place to go shopping and eating. This is also a good time to check out Haeundae Beach granting you arrive lunch time or in the afternoon. 1st stop: Gwangbok-Ro. 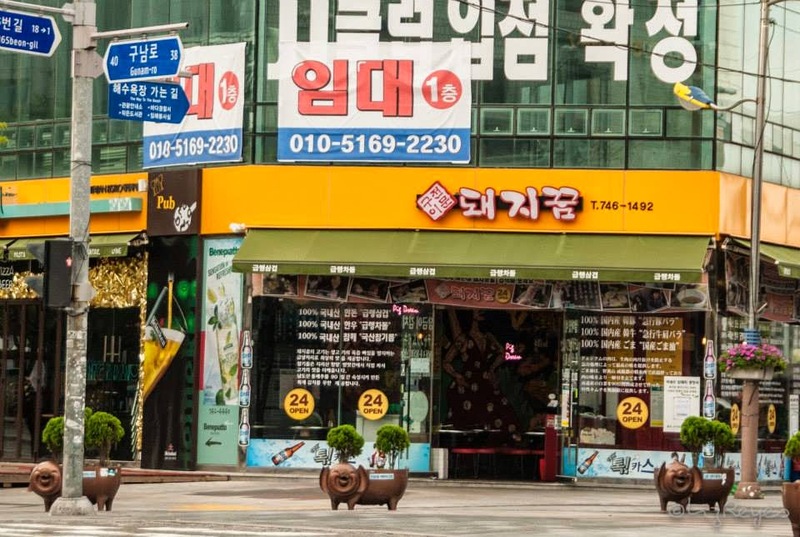 Check out the long strip of Korean restaurants along Gwangbok-Ro street in Busan. 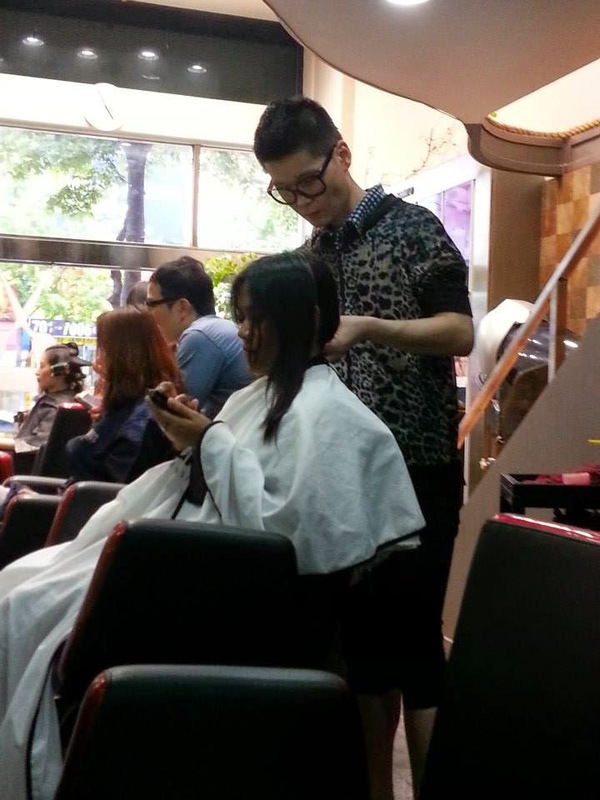 When in Korea, do what the Koreans do. Choose a cozy restaurant that looks like a carinderia and order some spicy chicken, match it with Soju then dine outside al fresco style. 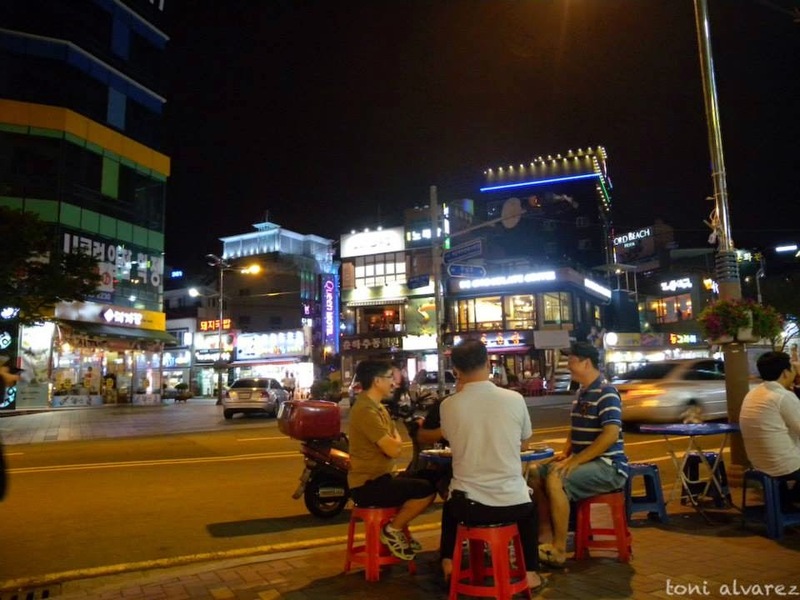 If you are fond of watching Koreanovelas, I’m pretty sure you have seen Koreans doing this, dining along the street while enjoying a Soju. Just a warning though, Soju is really a hard drink that it tastes like our local Gin Bulag. One Soju is too much for one person so just like tequila, you consume it by shots. 2nd stop: Stroll or head back to your hotel. You might want to grab a quick dessert at a nearby convenience store or head back to your hotel to catch some rest to prep yourself for a rather long walk the next day. 1st stop: Haedong Yonggungsa Temple. This temple is a must visit when in Busan. The temple is situated on the coast of north-eastern Busan which makes it an ideal spot for meditation and even picture taking. The temple houses a big golden buddha and I must say that this is probably one of the best temples I’ve seen so far, mainly because of its location. Haedong Yongggungsa Temple was built in 1376 by the Buddhist teacher Naong during the Goryeo Dynasty but was destroyed during the Japanese occupation in Korea. The said temple was later on rebuilt or recreated in 1970. 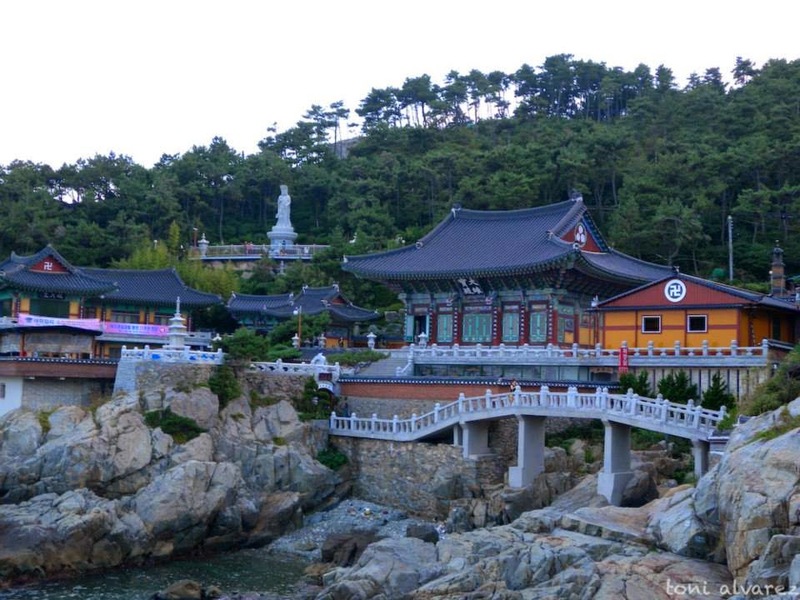 How to get there: From Busan station, take Bus 181 and get off at ‘Yonggungsa Temple’. You need to walk for 10 minutes before reaching the temple. 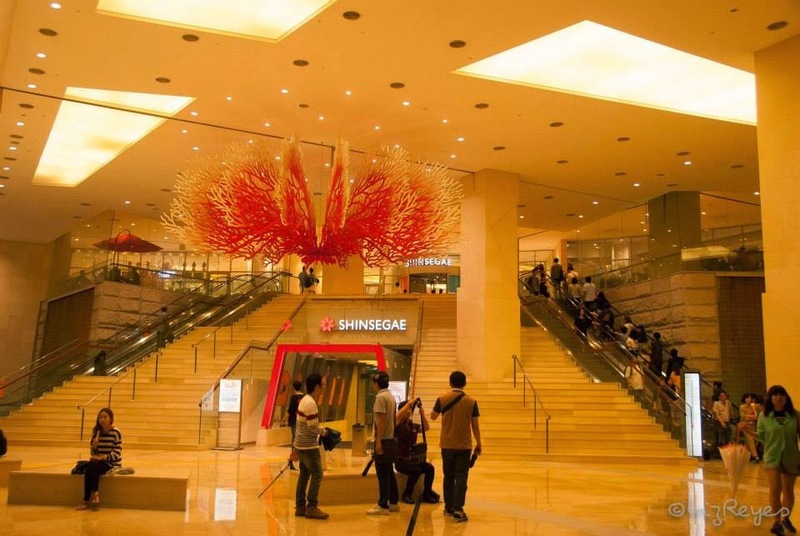 2nd stop: Shinsegae Centum City. 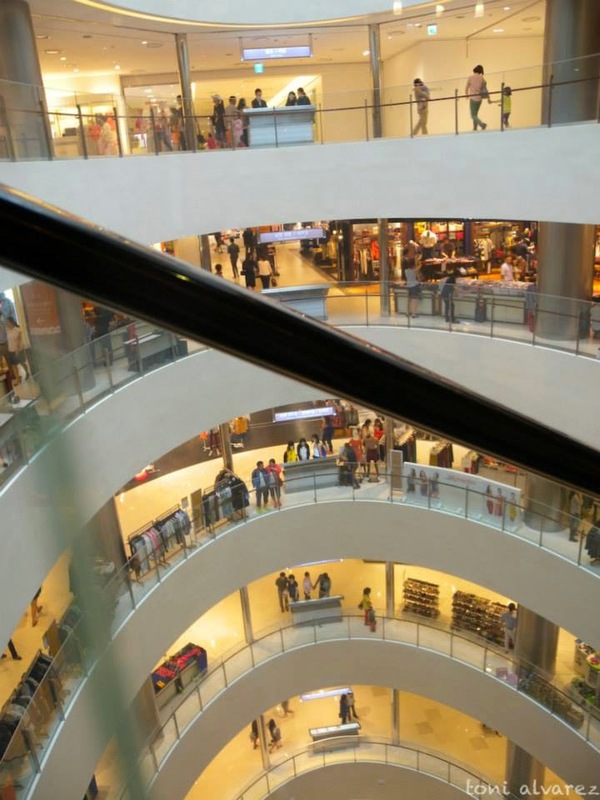 This mall is considered by the Guinness Book of World Records as the largest shopping complex in the world. 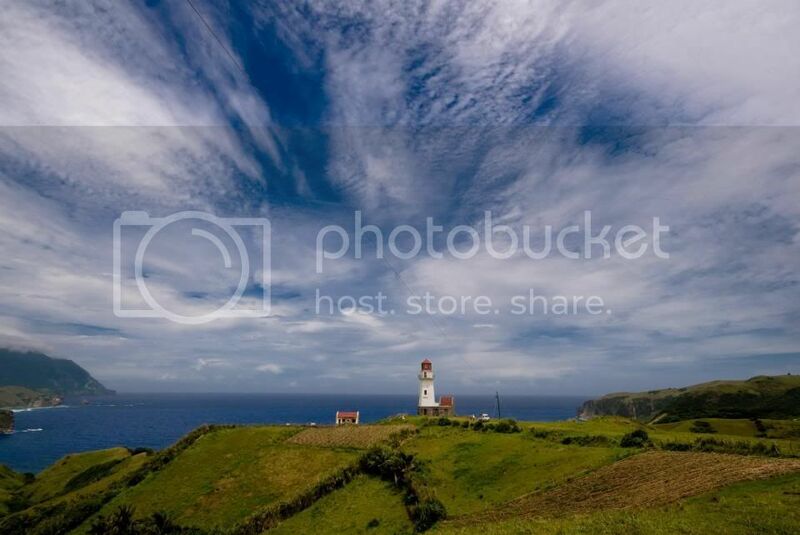 If you are someone who loves shopping or even window shopping, then you’d definitely enjoy strolling here. 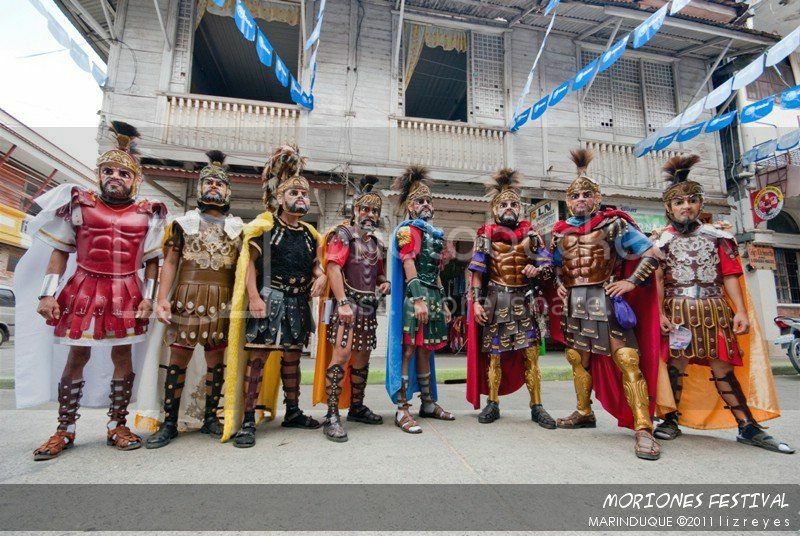 However, I advise that you just save your money for Nampodong Fashion Street instead. 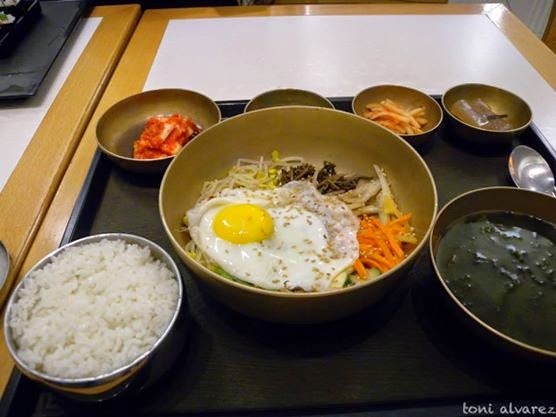 Just take your lunch at the Food Hall and buy yourself a Bibimbap. Purchasing meals at the Food Hall is by ticketing system. You first need to buy a ticket at the main cashier to purchase meals at any of the food stalls available at the Food Hall. 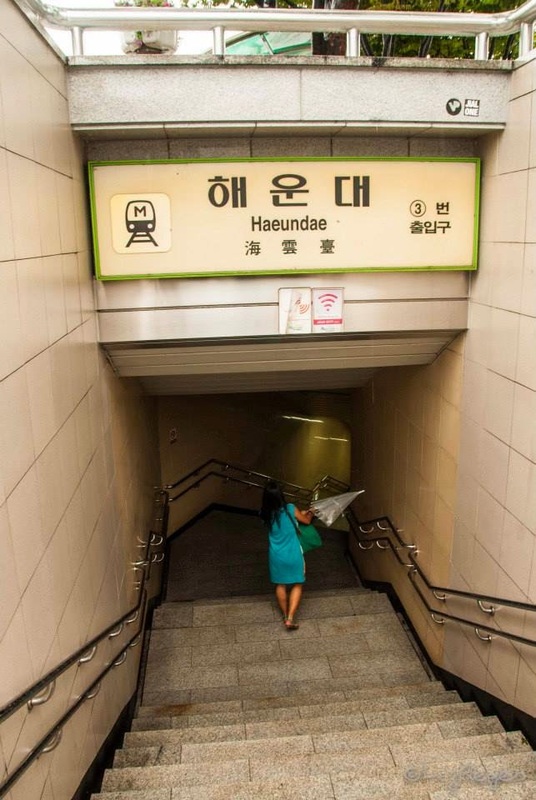 How to get there: From Busan station, take the subway to Centum City station (Busan Subway line #2), the station is connected to the mall. 3rd stop: Nampo-Dong Flea Market. Definitely a bargain hunter’s paradise. The long strip of clothes, shoes, accessories, etc. will leave you breathless and your pockets empty. Make sure to also try their very own version of Buchi. It’s being sold in a hawker’s stall along the flea market. 4th stop: Yong-Dusan Park and Busan Tower. If you still have enough time and energy, visit the Yong-Dusan Park and Busan Tower. If you are currently in a relationship, don’t forget to bring with you a padlock. Write you and your partner’s name in the padlock, lock it and put or throw away the key in a key bin provided. This symbolizes commitment between sweethearts never to separate. How to get there: At Nampodong Station, take Exit 7, Go 350m on Gwangbok-Ro Street towards the Yongdusan Park escalator on the right. 5th stop: Gwangan Bridge. Another option instead of going to the Busan Tower is to head straight to Gwanggali Bridge, Korea’s longest two-storey bridge, which looks amazing especially at night because of it’s beautiful light show. 6th stop: Dinner time. Take your dinner at any restaurant near Gwanggali Beach to give you more time to marvel at the beautiful Gwanggali Bridge. 1st stop: Haeundae Beach. Wake up early to catch the sunrise at Haeundae Beach. 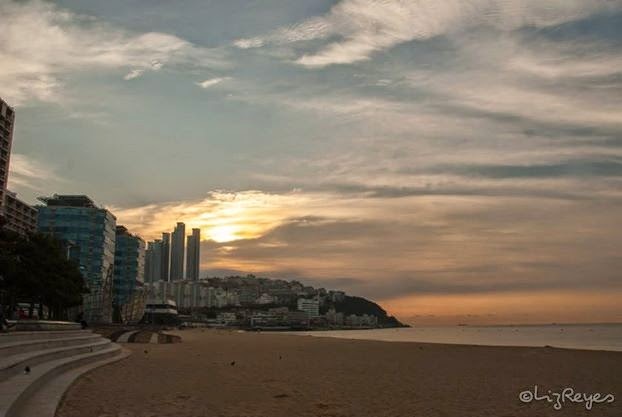 Grab a coffee at a nearby 7-eleven convenience store (stores and coffee shops in Busan open late) and stroll along the powdery, white sand of Haeundae Beach while waiting for the sunrise. 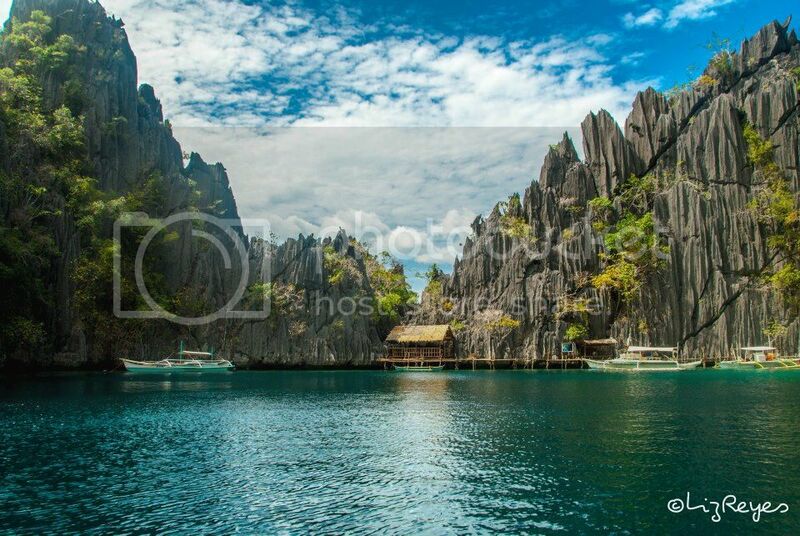 If you are in the mood for swimming, you may also slip into your swimsuit and take a quick dip in the water. Although best time to take a swim is during the months June and July. 2nd stop: Puppy Cafe. 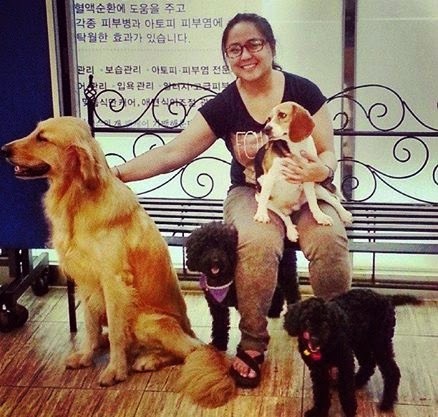 if you are a dog or cat lover, then going to the Puppy Cafe in Jangsan should top your list. 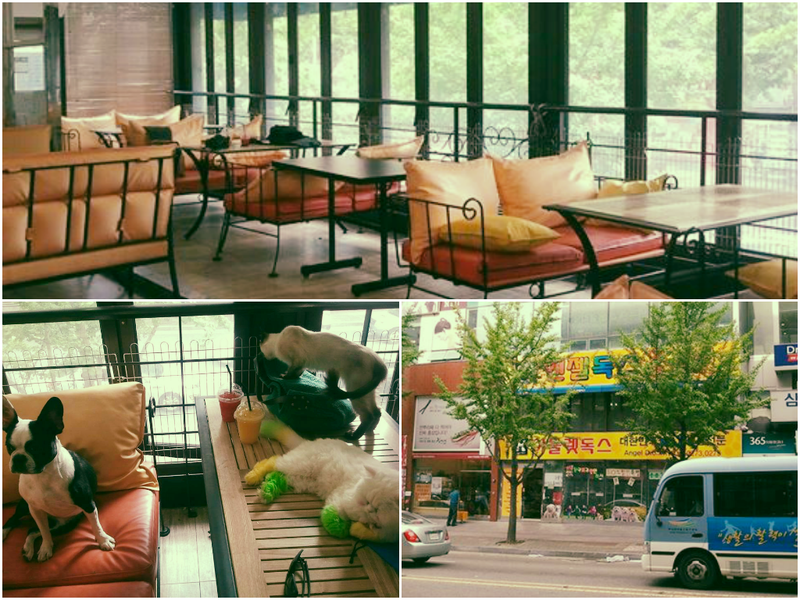 Entrance fee to the Puppy Cafe costs KRW 8,000 or roughly Php 340 and is inclusive of a free drink of your choice (smoothie, iced tea, coffee, etc.) and a buffet of bite sized cakes and pastries. However, the main attraction of course are the cute and cuddly dogs and cats that will excitedly welcome you once you step into the cafe. Don’t fret, these furry and adorable creatures are very friendly though they tend to mob you when they get really excited by your presence, which is actually really adorable. 3rd stop: Face Shop. 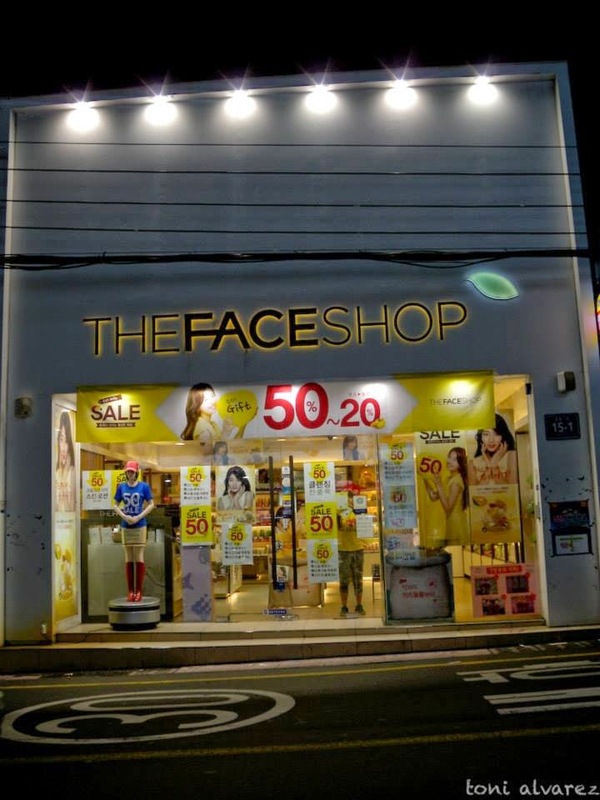 The Face Shop is proudly Korean made so it is understandable why products from The Face Shop in Korea is dirt cheap compared here in the Philippines. When we went there last September, all Face Shop stores are on 50% SALE. To give an estimate, Face Shop’s 365 Herb Day, which usually costs Php265 in Manila, only costs less than Php40. So yes, even though they are not on SALE, products are still very affordable. Various Korean facial brands like Etude House, Missha and Tony Moly among others are also everywhere, especially in U-dong, Haeundae-gu. 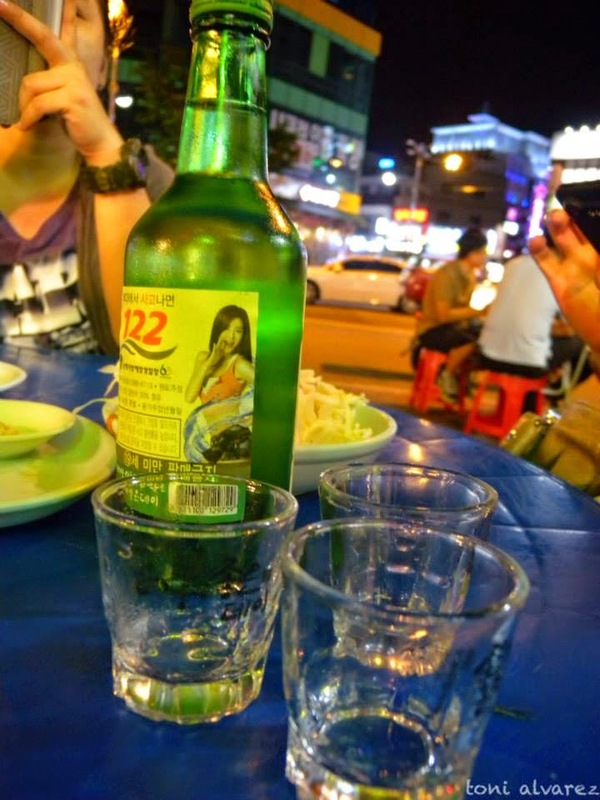 Never leave Korea without trying their famous Soju. It's alcohol content varies from about 16.7% to about 45%. 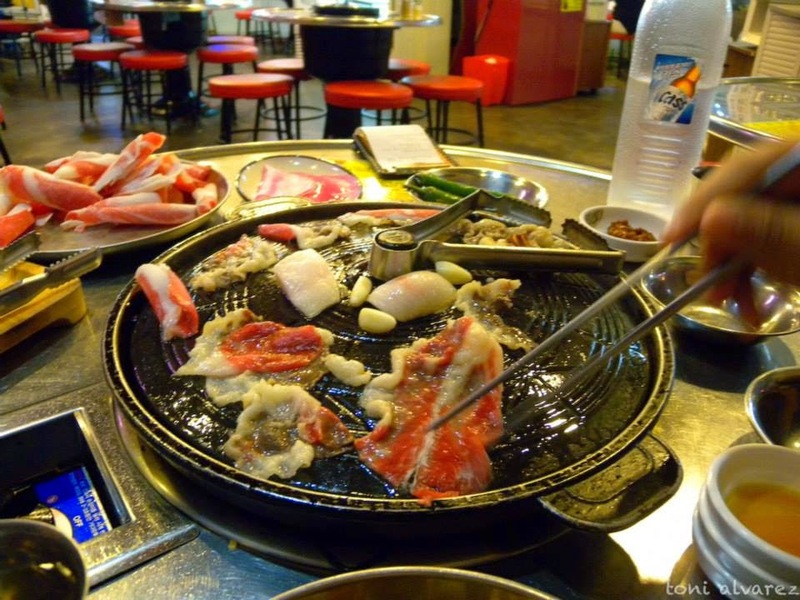 If you are a fan of Korean Barbecue, then you know that eating authentic Korean Barbecue should top your list when in Korea, you can even partner it with Soju. Bike or wander in Busan. 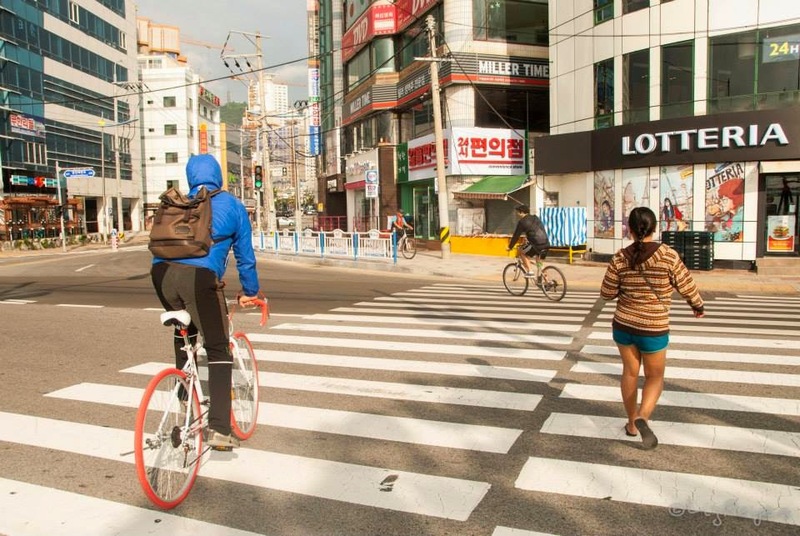 We haven't tried biking in Busan yet but if ever your guesthouse or you find a place where you can rent a bike, then do so by all means. You can also try this U-Bike website although the site seems complicated. 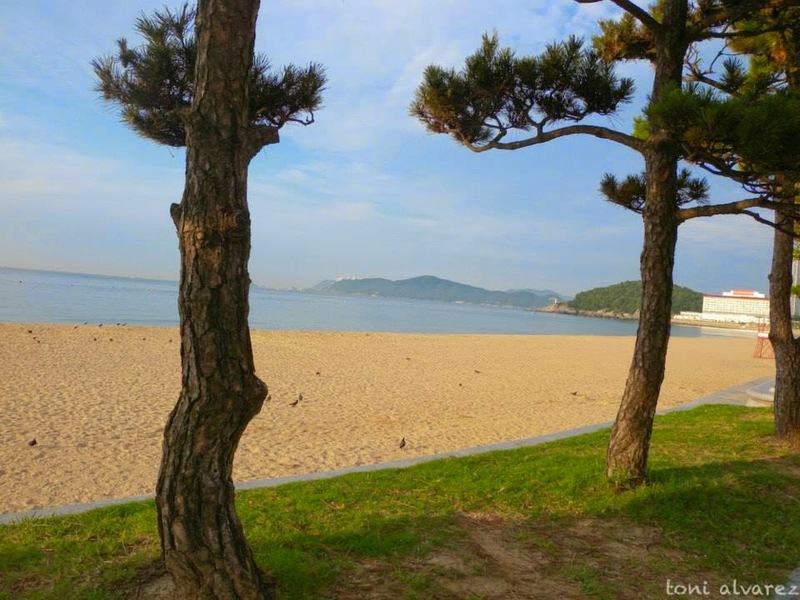 If you're not in luck and can't find any bike rentals, then exploring Busan by foot is not a bad idea either. Just wander around, who knows what you'll discover. 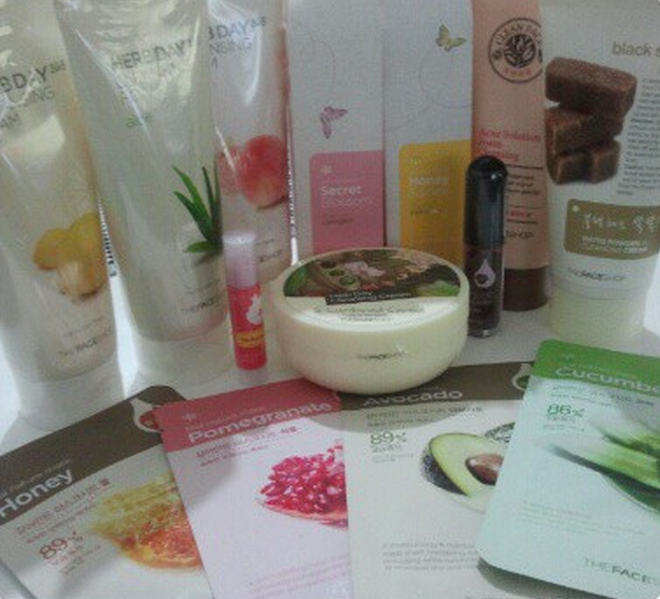 The Face Shop skin care products. As I have mentioned, their products are very affordable. Great 'pasalubong' or gifts to your family and friends back home. Shopping at The Face Shop can be pretty addictive. You have been warned. In the Philippines, the Balete tree is often associated as homes not for just insects, but also for supernatural creatures like tikbalang (demon horse), dwende (elves), kapre (smoking giants), and diwata(fairies). Urban legend has it that at night, if you drive through Balete Drive in New Manila, Quezon City, a street named after a huge Balete tree that used to stand there in the middle of the road, a White Lady will suddenly appear out of nowhere and try to flag down your vehicle. But if you really want to get scared, you’ll have to go out to the province and visit these three mystical trees. These are not your ordinary trees. Make sure to bring your camera (or phone) to document any unnatural sightings or suspicious sounds emanating from these mysterious local attractions. When in Siquijor, don’t miss the chance to visit this century-old Balete tree. Because of its humungous size and eerie outline, this 400-year old tree easily became a tourist spot in the province of Siquijor. 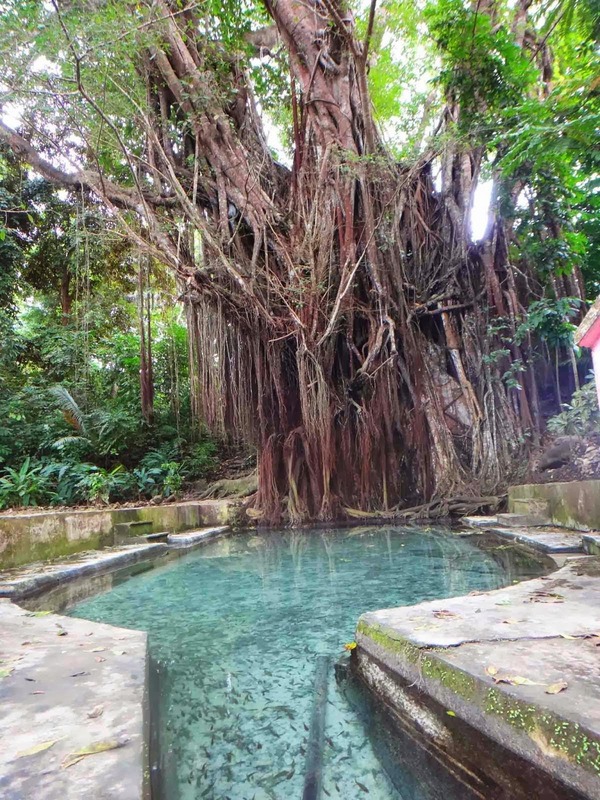 What makes this Balete tree unique is the spring that emanates from the roots of the tree that goes directly to the man-made pool beneath it. It is interesting to note that the locals don’t know where the water is coming from. Surprisingly, the water is very clean with fish swimming in it. If you want an instant fish spa, you may even dip your feet into the water and the doctor fish or the garra rufa will gladly exfoliate your feet for you. Everything in here is for free but you may wish to give a donation for the maintenance of the place. As for hair-raising stories about this ancient tree, locals claim that they have seen old little people or elves surrounding the tree when the moon is full and apparitions during rainy nights. It’s up to you to find out the truth at your own risk. 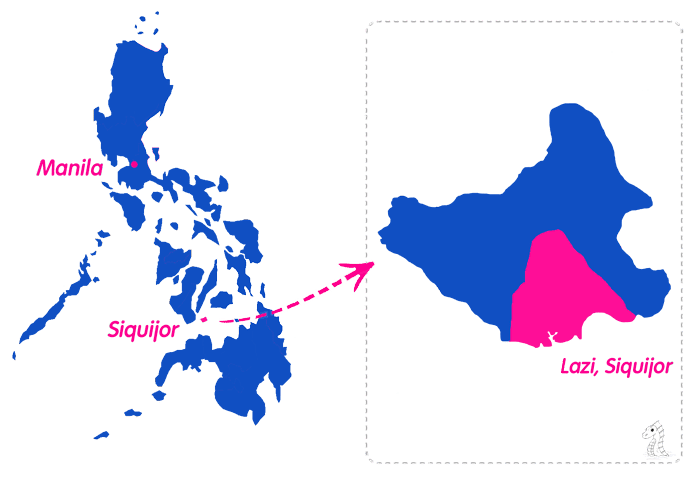 Get to Siquijor from Manila by taking a 1-hour flight to Dumaguete City, Negros Oriental and then taking another 1-hour ferry ride to Larena, Siquijor from the Dumaguete Port. Hire a multicab to bring you to Campalanas where the tree is located. 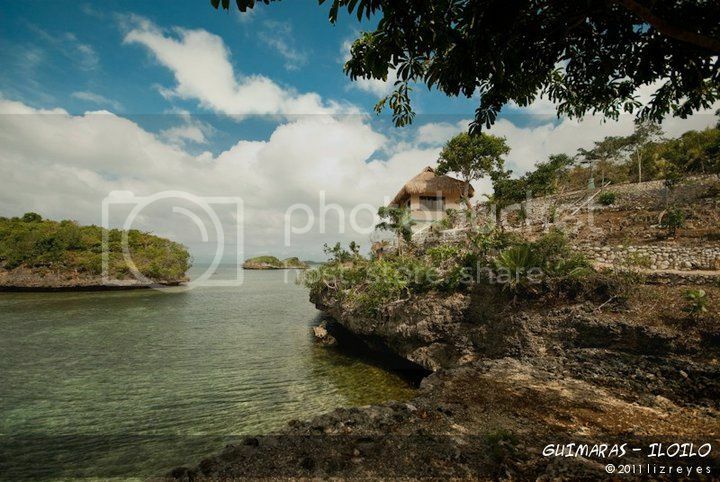 It is 10 meters from Siquijor’s National Highway and just few minutes away from Capilay Spring. Not a fan of otherworldly stories? 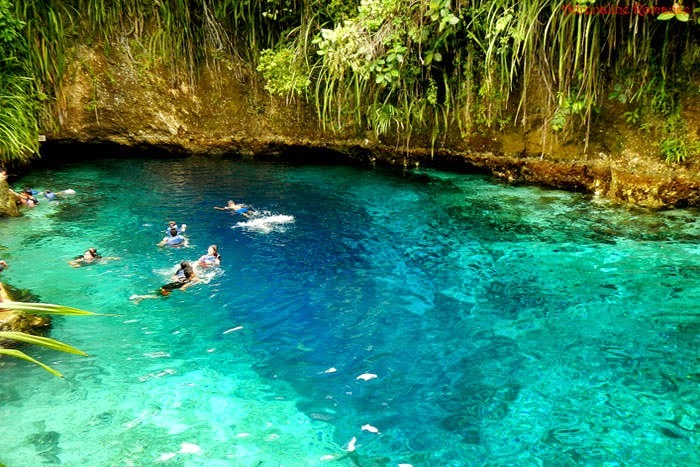 How about this: rivers are generally bodies of fresh water but the Enchanted River has salt water flowing through it. What’s interesting is that there is no visible source of where that salt water is coming from. 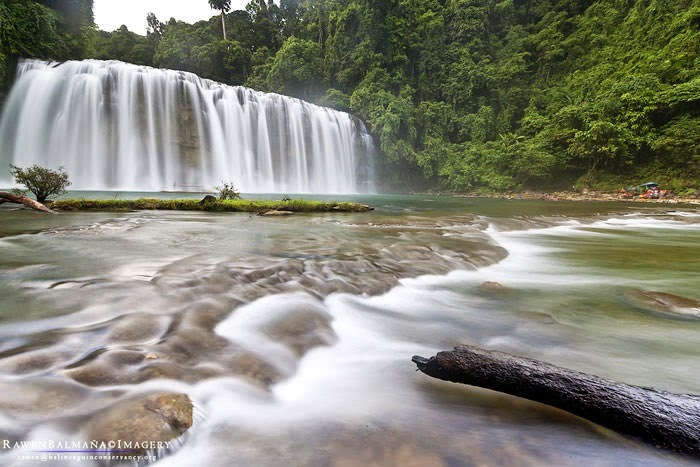 ✈ The easiest route to get to these places in Surigao del Sur from Manila is via a 1.5 hour flight to Butuan City, Agusan del Norte. From Butuan City you can get to either Hinatuan or Bislig by bus with both destinations taking approximately 4 to 5 hours of travel time.